Image by Lidia Crisafulli; featuring Gareth Murphy. If there’s one thing you must do while visiting London, it’s of course head to the theatre. More people attended London’s theatres last year than Premier League football matches. But with hundreds of options to choose from – ranging from plays at the Old Vic, to the big West End musicals – how do you choose something that ticks all of the boxes, and is easy on the budget? Might I suggest something a little different. The West End is wonderful, but it can be pricey, and you have the opportunity to see a lot of the big musicals in places besides London. London is famed also for her many smaller theatres, where new works are created and daringly developed, and also where some of our most accomplished theatre-makers were born and nurtured. The Blue Elephant Theatre is one such gem, tucked away in the South London district of Camberwell. If you’re looking to go “where the locals go”, the Blue Elephant is just the place. 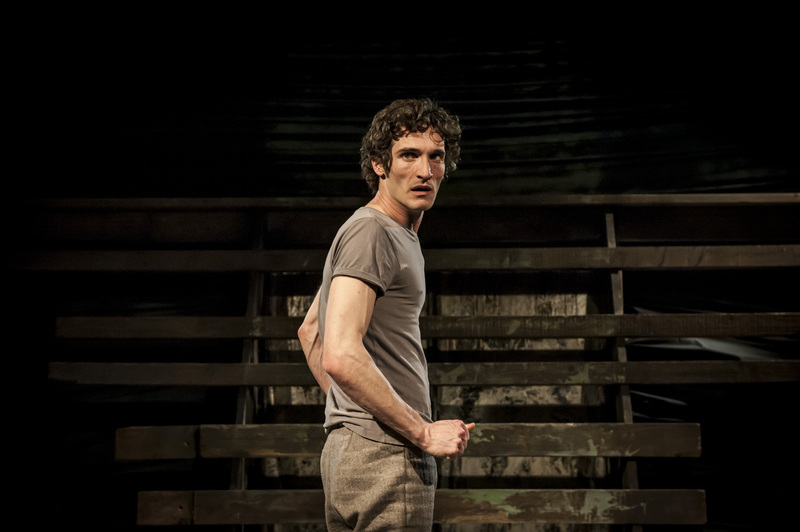 Currently showing until April 4 is an adaptation of Mervyn Peake’s dark novella, Boy in Darkness. The Blue Elephant has enjoyed a special relationship with Mervyn Peake’s work, having already produced successful stage premieres of The Cave and Noah’s Ark. Boy in Darkness is the story of a privileged young teen escaping a castle; a story steeped in adventure, horror and the macabre. The novella has been re-worked as a solo performance by adaptor and performer Gareth Murphy, and directed by John Walton. The story’s root as a novella shines through in Murphy’s performance, which is a wonderful mix of storytelling and physical theatre. It lends itself well to being a solo work, with the performer craftily switching between the narrator and the story’s four characters with a smoothness as though reading a storybook. The energy and physicality of the piece enables the adult performer to convincingly convey the young boy’s terrifying journey. The studio theatre has been converted to utilise a thrust stage that creates an even greater intimacy, pulling the audience into the dark depths of the boy’s adventure into the underworld. 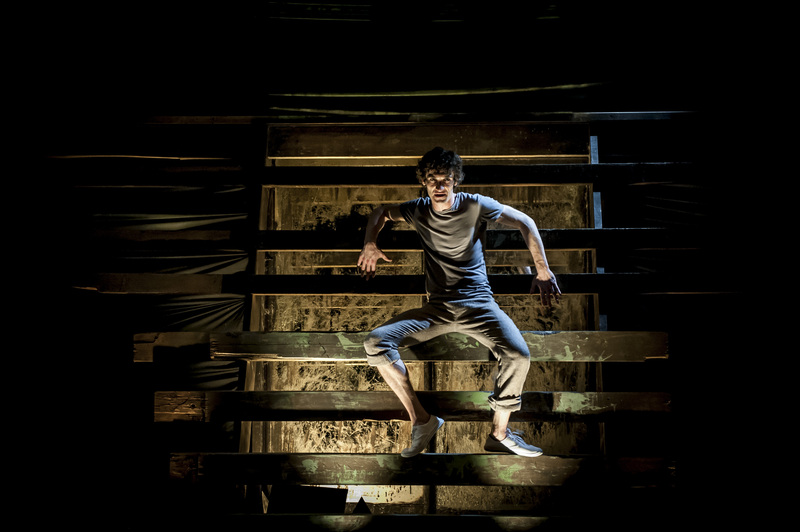 Murphy utilises the space to its full potential – climbing about not only Martin Thomas’ brilliant timber set, but also scaling the walls of the theatre itself, radiators, and clambering behind the audience. The boy’s disturbing encounter with the unsavoury characters of Goat and Hyena sends chills down the spine, but is nothing on the evil that is to come later in the form of their lord – the apparent boy-eating Lamb. The presence of these three characters easily justifies the fear that dominates the boy – in his eyes, his facial intensity, his words and of course, his movements. Boy in Darkness is a fairytale for adults that makes the Grimm Brothers look like Disney. If you’re looking for either something different to experience – or simply physical theatre and storytelling at its finest – be sure to check it out. And at only £12.50 full price (or a tenner for students), it’s an absolute steal for theatre in this fine city. Blog written by and play reviewed by Charlotte Everett. Boy in Darkness is on at Blue Elephant Theatre until April 4, shows Wednesday to Saturday, with all performances at 8pm. This entry was posted in London, Theatre Reviews, Tourism and tagged Blue Elephant, Boy in Darkness, Camberwell, Gareth Murphy, London, Mervyn Peake, Theatre.